Product prices and availability are accurate as of 2019-04-07 23:12:14 EDT and are subject to change. Any price and availability information displayed on http://www.amazon.com/ at the time of purchase will apply to the purchase of this product. 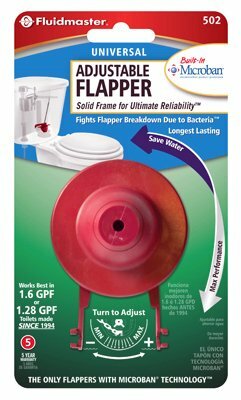 Red, Adjust A Flush Flapper, Dials To Adjust Volume For A Custom Flush, Fits Most Toilets Including 1.6 Gallon, Has Built-In Microban that helps fight flapper breakdown due to bacteria. Thermoplastic Material For Harsh Water Conditions, Five Year Warranty.